Director – Nick Copus, Teleplay – Patrick Harbinson, Based on the Novel by John Wyndham, Producer – Stephen Smallwood, Photography – Ben Smithard, Music – Alan Boyd, Visual Effects Supervisor – Tom Turnbull, Special Effects Supervisor – Neal Champion, Makeup Design – Mary Southgate, Production Design – Joel Collins. Production Company – BBC Wales/Power-Prodigy/Triffids Productions Ltd/Triffids (Canada) Productions Inc.
A deadly, ambulatory plant known as the triffid has been discovered in Africa. It produces an oil that has proved the solution to the Global Warming crisis. Bill Masen works as a triffid farmer, milking them for their oil. After an environmental protestor breaks into the triffid factory, Bill is stung in the eyes by acid from a triffid’s stinger and has to be rushed to hospital. With his eyes bandaged, he is not able to see the passing of a comet that night. The comet plays havoc with the sun’s rays, causing a flash that blinds everyone watching. Bill wakes in the morning and removes his bandages to find the hospital and all of London around him in chaos with the population blinded. He encounters Jo Playton, a BBC reporter who remains sighted because she was in the Underground, and they try to decide what to do. The protestor then turns the electricity off at the farm and the triffids get loose. Bill realises that everyone is in danger as the triffids head to the cities, regarding the blinded populace as food. Various groups rise up out of the chaos, trying to maintain order. Major Coker forms one such group but this is taken over by the double-dealing Torrence who wants all power for himself. Torrence orders Bill and Coker killed but they escape. 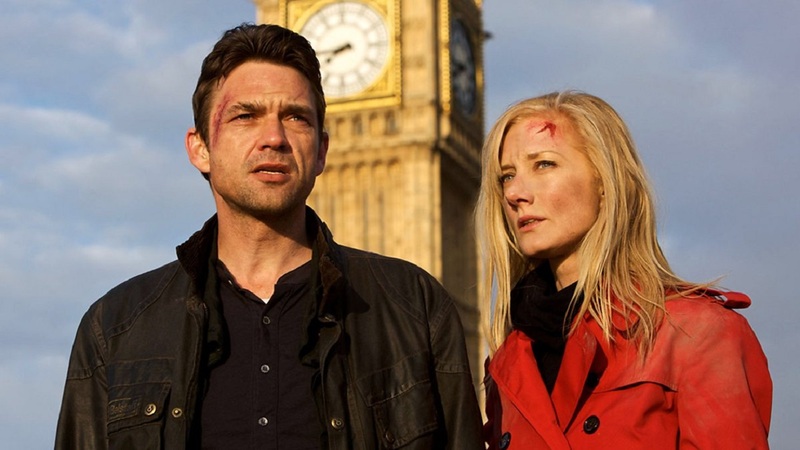 Believing them dead, Torrence tries to claim Jo for himself while using her to broadcast messages of comfort on the radio to bring survivors to London and under his control. Bill makes his way through the countryside, determined to find a solution to the triffid problem before the plants overrun everything. John Wyndham’s The Day of the Triffids (1951) is one of the classic science-fiction novels. It is even one of the works that has spread over to mainstream recognition – where I come from, it was studied in English class in school – and has proven the most popular of Wyndham’s books. It has undergone three adaptations in the media. The first was the film version The Day of the Triffids (1962), which brought the triffids to life but did little more than that, adding an absurdly upbeat ending where the plants are overcome with seawater. This was followed by the BBC-produced The Day of the Triffids (1981), an excellent tv adaptation in six half-hour parts that was extremely faithful to the book and gave Wyndham’s ideas an excellent showing. This third production also comes from the BBC and aired in two two-hour parts. The mini-series opens promisingly. It shows a Day of the Triffids smartly updated for the modern era. Now they are placed into the context of modern concerns such as Global Warming and the peak-oil crisis – “Triffid oil saved the world from global warming,” it is stated at one point. We see the triffids being farmed with modern technological methods and in an amusing touch it becomes an environmental protestor that sets them free. The blinding is given a more scientific updating in being plausibly related to solar flares. The advent of modern CGI effects and animatronics allows the triffids to be more mobile than any of their previous incarnations were. Their appearances are excitingly staged and they become far more of a looming menace to civilisation here than they are in the other versions. On the other hand, The Day of the Triffids 2009 is a disappointment. There is a reasonable amount of the book up there on the screen – unfortunately, it does not much resemble the way that John Wyndham wrote it. Wyndham wrote a book in the H.G. Wells vein that was about post-War Britain dealing with the collapse of civilised order and the various regimes that rise up seeking to fill the vacuum. The 2009 tv mini-series displays little interest in the sociological perspective and becomes more about humanity fighting off deadly plants. The story takes place with the collapse of society as a backdrop but this is only routinely depicted here. The 1981 mini-series had a great deal of effect because it was about ordinary people meeting the end of civilisation and its everyday approach came in marked contrast to the post-holocaust Western of its contemporary Mad Max 2 (1981). However, the 2009 version seems just another post-apocalyptic story by the numbers and disinterested in depicting the human reaction to the downfall of civilisation. All the focus is instead placed on triffid attacks or the melodramatics of Eddie Izzard’s would-be dictator. 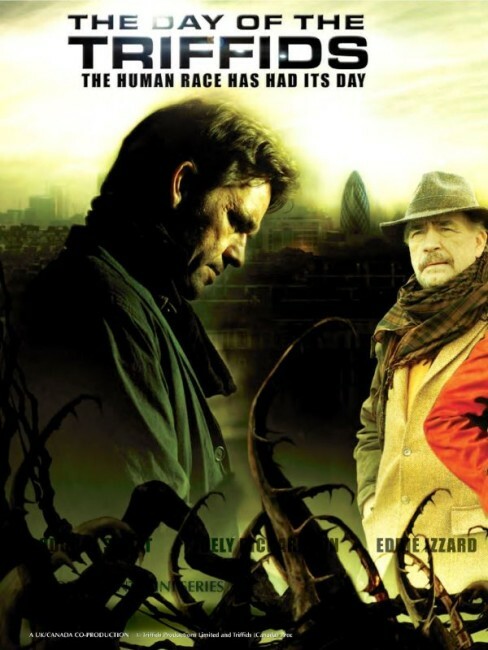 Certainly, some of the impact that The Day of the Triffids would have today has effectively had the edge taken off it by films like 28 Days Later (2002) and Blindness (2008) having borrowed sections from the story. The book’s social portrait is there but when it is not being conflated into something that belongs more properly in a comic-book, it is glossed over. Major Coker does briefly handcuff Dougray Scott up to a single blind man in order to forage supplies (not an entire chain gang of them as in the book) but there is little concern for Coker’s wider mission to save the blind. (Here Dougray Scott’s voiceover is almost laughably tame in its understatement: “Coker’s plan was an inconvenience that prevented me from getting to Shirning to deal with the triffids.”) The book features the group organised by Beadley that advocates sighted men breeding with multiple blind women to keep the population going – here that becomes a government group and Beadley is a woman, but there is no mention of the polygamous arrangement they want to enforce, merely their advocacy that the blind be abandoned. The worst character is that of Miss Durrant who in the book naively tries to create a community along Christian lines to take care of the blind. In the mini-series, she becomes a nun (Vanessa Redgrave) and certainly organises a Christian community – but now one that is almost Amish in its anti-technological views and, in a ridiculous twist that smacks of Star Trek (1966-9) Society of the Week plotting, she is revealed to be secretly feeding the weak and infirm to the triffids. Here the thoroughly banal critique made of each society is no more than that they fail to acknowledge the threat of the triffid menace. What the mini-series also did not need was the character of Torrence. Torrence is there in the book – he turns up near the end as a minor character, trying to marshal the communities under military order. In the mini-series, Torrence is pumped up to become a despot who seeks all power and privilege for himself, even engineers the apparent killing of Bill and Coker in order to claim control and then make moves on Jo. 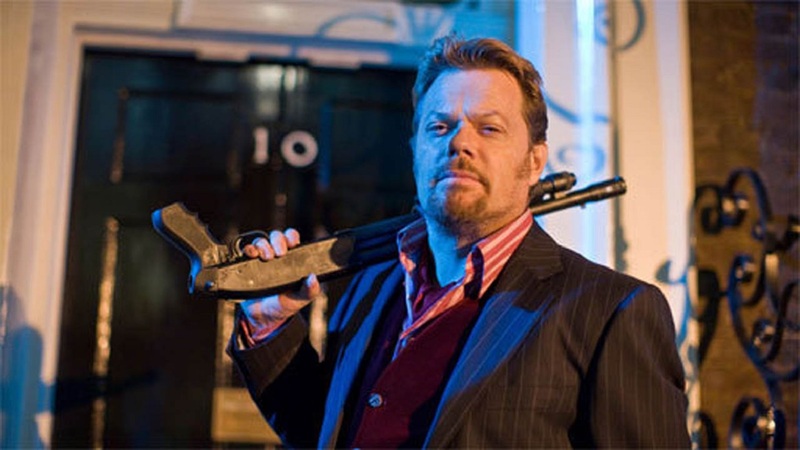 It is this need to write a traditional black hat villain (as well as Eddie Izzard’s broad and one-dimensional performance that frequently verges on camp) that causes The Day of the Triffids to sink from a classic story to routine action adventure. Other aspects have been added to the story. The most notable of these is the creation of a half-hearted quest for Bill to find his father that makes up the middle of the story; by contrast, Bill’s father does not exist or have any equivalent in the book. This adds another aspect that completely warps the story – the need for an upbeat ending. This version, the 1981 mini-series and book arrive at more or less the same place – with people abandoning the mainland and building a refuge on the Isle of Wight after clearing it of triffids. During the way there however, this version adds a plot about Bill’s father attempting to come up with a cure by cross-pollinating triffid genes and with Bill rediscovering a forgotten childhood memory (a plot twist that seems like it belongs in a Dario Argento film) that allows the party to use drops of triffid poison in their eyes to walk through the triffid hordes with immunity and get to freedom. The point that John Wyndham made was that there are no shortcuts or last minute solutions to overcoming the collapse of civilisation, that we need to find the social model that allows us to best survive it.